The annual Exporter of the Year Competition celebrates the vital role exporters play in the economy of the Western Cape, South Africa. The competition, which is in its 27th year, is designed to honour and promote large and small businesses that have proven their excellence in tough international markets and that inspire other ambitious companies to export their goods and services. Once again the competition has assessed an amazing variety of companies, from companies working in fields as broad as the space industry, beauty products and recycling, all of whom continue to grow and succeed in very difficult trading conditions. Even more noteworthy is that more than a third of the entrants this year are companies run by women. 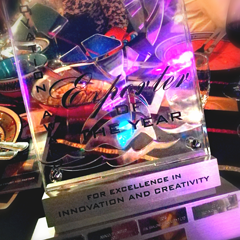 Environ Skin Care is very proud to have won the Innovation Award at the 2017 Exporter of the Year competition for its excellence in Innovation and Creativity and to have been one of the thirteen finalists. “Woman in business face challenges – challenges that can be overcome by determination, believing in yourself, your product and your diverse team and giving credit where credit is due. This team then becomes the heartbeat of the business. Passion is key to lead a team on a journey which can have obstacles, detours and opportunities to reach for the blue skies by choosing the correct routes with greater speed and agility to ensure the scenery for all becomes more beautiful and inspiring as days, months and years go by. 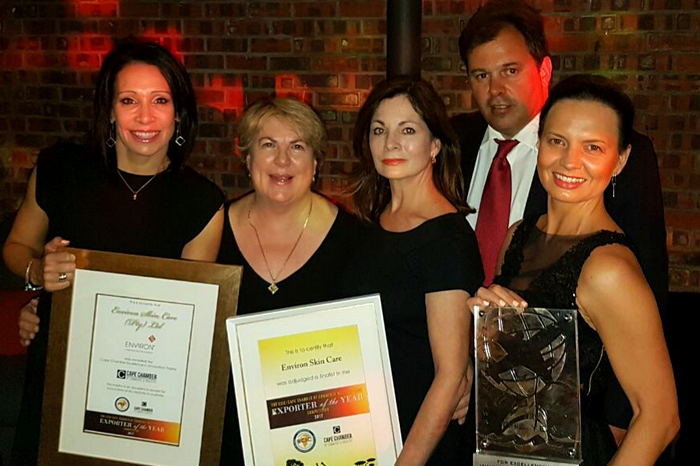 One world, one team, one dream, one success for all,” said Mrs. Val Carstens, former CEO and current Chairman. 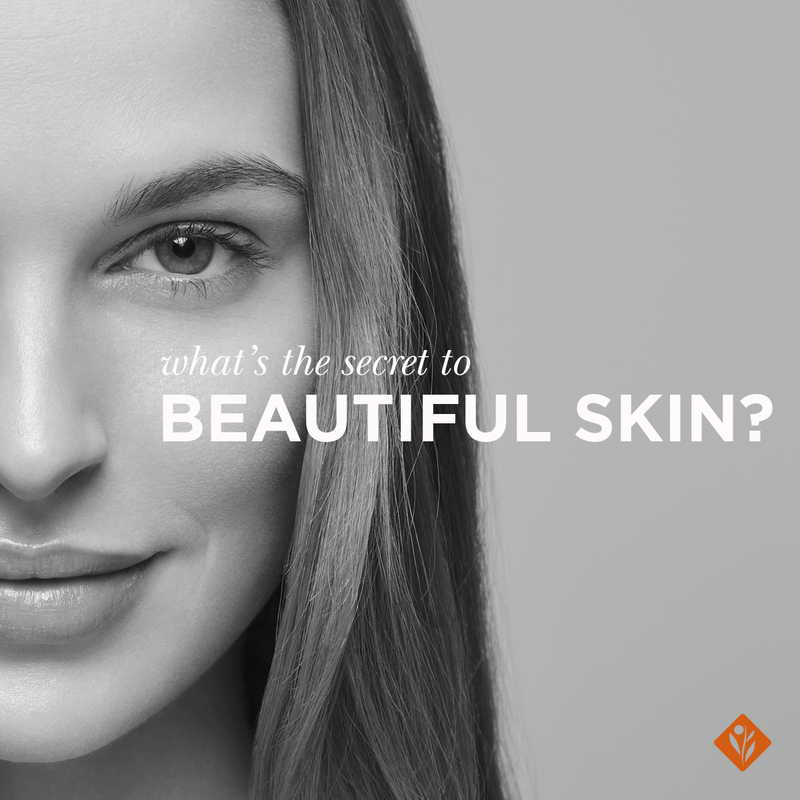 Dr Des, Environ Founder and Scientific Director, has made it his personal mission to explore new and innovative ways to future-proof skins by combining the best of what science and cutting-edge technology has to offer with sound skin care principles to provide superior scientific-based skin care for everyone. At his side, his sister, Val Carstens, has grown the Environ Skin Care business into a globally recognised, trusted and loved brand that is built on science, beauty and care. Today Environ has over 140 products in more than 70 countries and has developed an extensive global network of Distributors as a direct result of the scientifically proven effectiveness of our product range and the entrepreneurial drive of this brother and sister team. 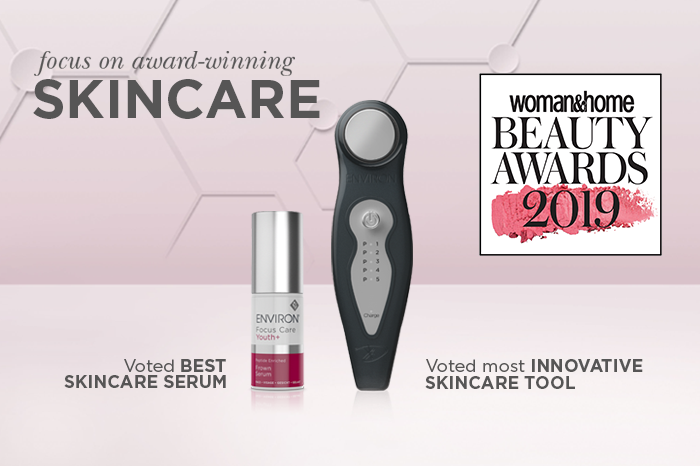 After nearly 28 years, and in the hands of Environ’s new CEO, Lauren Michlo, the business remains true to its vision of creating a world where healthy skin is the norm and not the exception. Research and Development of new products remains high on the company agenda. Production standards and efficiencies in Environ’s ISO accredited world class manufacturing facility are driven hard as the business sees a double digit growth in demand. Three core strategic pillars form the foundation for this challenger brand within the niche Professional Skincare channel: Education of Skin Care Professionals using modern, multi-medium methodologies; Contemporary and highly effective Professional Skincare Protocols that deliver facial experiences and results like no other; Retail ranges of powerhouse formulations that help to make a lasting difference to the appearance of the skin. 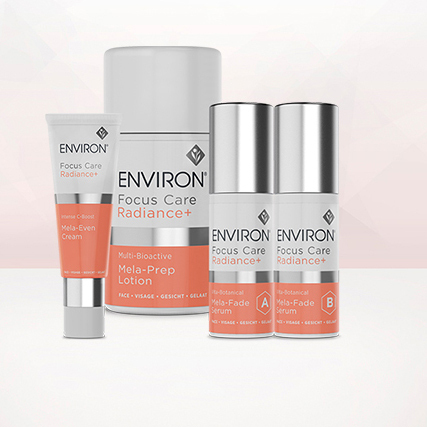 Every single element that makes up the Environ brand world across these three pillars is conceived and created by the Global Brand Team and their strategic Agency Partners before it is handed over to the 40 different in-market teams to localise and implement in their respective markets. Environ’s relationship with its Distributors has in most instances been a long and successful one with many Distributors having been part of Environ’s success story for over 20 years. October 2017 saw Environ celebrating its 25th year in the Japanese market attesting to the longevity and sustainability of this brand in the export market. As a global Professional Skincare brand, we are proud enough to recommend our products to the people who matter most in our lives. If we weren’t, we wouldn’t create them. 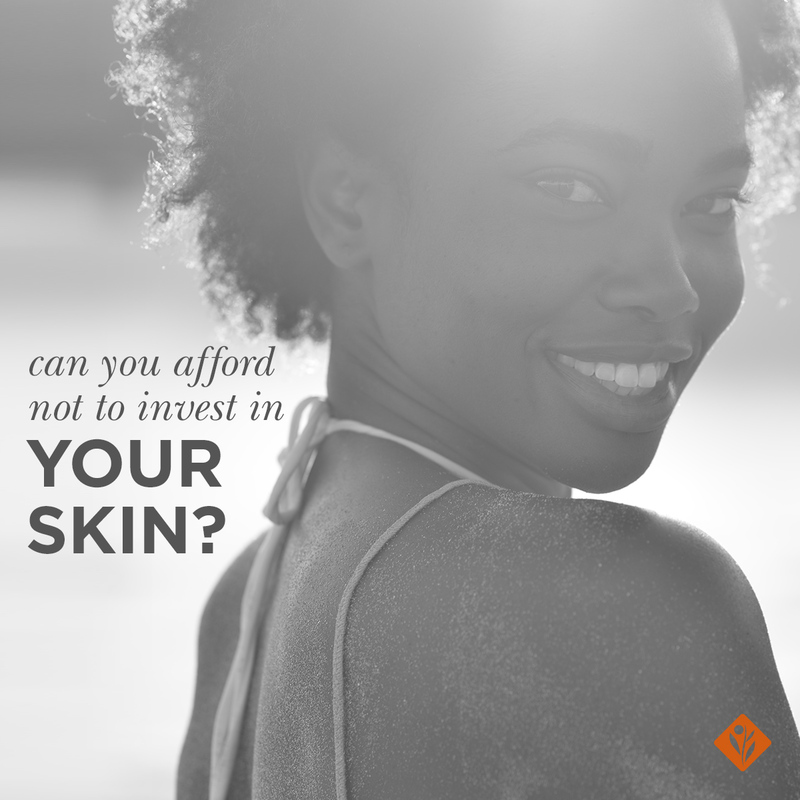 As an innovative and successful global business, we will keep making skin beautiful for generations to come, because we exist to keep skin beautiful for life.